Born in 1897 John “Jack” Everett Achttien ran away from home at age 16 and settled 45 miles outside Cheyenne, Wyoming, earning a living as a cowhand, blacksmith and silversmith. He and his wife Marie homesteaded 2 miles outside Altus, Wyoming surrounded by the Farthing Ranch. 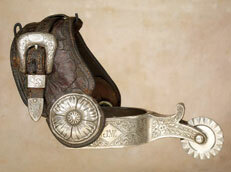 Jack was considered an artist in silver, creating bits, spurs and bridles. In the blacksmith trade, Jack made branding irons and shoed horses. He was also known to break horses for the local ranchers. Working on the Inness Ranch rounding up cattle for branding at the end of a long day, his horse lurched forward allowing his rope to slacken. The rope entangled Jack’s feet in the stirrup, his saddle slipped and the horse bolted, dragging Jack along the ground. The rancher’s daughter came up alongside and grabbed for the bridle, which came off in her hand, and Jack was dragged to death. The family has always suspected foul play from surrounding powerful ranchers, feeling his death was an attempt to drive the homesteaders from their land. Marie continued to live on the property. Jack left his belongings to his son Jack Jr. and High Noon was pleased to offer these items for the family of Jack Achttien.